Newspaper would be the next choice. You could simply place an ad in the classified section. The cost will depend on the newspaper. For example, a full-page ad in the Wall Street Journal would costs you about $164,300. This is black and white only. If you decided on color, the ad would cost you $210,300. A half-page ad in the Wall Street Journal would cost you about $96,900 or close to it. If you want color, the cost would be higher, like $137,595 or more. A full-page black-and-white ad in the Washington Post would cost you nearly $100,000. While in the Los Angeles Times, a full-page ad would run you close to $70,000. If you live in a small town, you will find the rates for advertising in your local paper will be much cheaper. 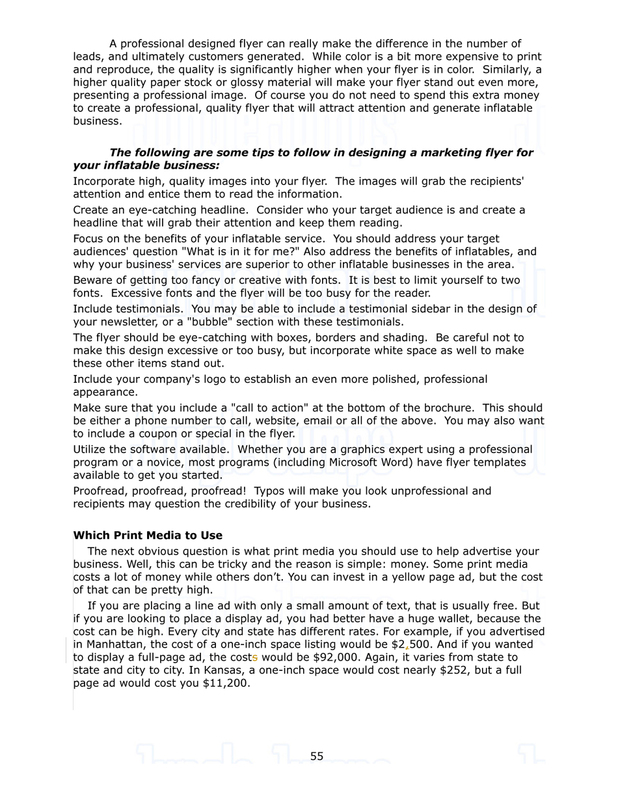 A full-page local paper ad may cost you about $1000. Keep in mind, there is a difference between a full-page or half-page ad and classified ads. With classified ads, you are only placing a two, three, or four line ad, with just a brief description of what you are offering, along with a contact number. A full-page or half-page ad is not in the classified section but on a separate page. That is why half- and full-page ads are so much more expensive. Print advertising is another way of getting your business out there to the public. You simply sign up with a company that handles the print advertising, pay the requested fee and let them take care of the promotion. Not bad. Running an ad in a parents’ magazine is a great way to stretch your dollar and ad longevity. Magazine are generally kept for quite some time and re-circulated among parents, giving your ad additional exposure. The key is to design an ad that will stand out from the competition and make your company look different.Here is a link to a well known print advertiser you may want to consider. They have a great reputation: www.printadvertising.comHow to Effectively Use Direct MailDirect mail has been and continues to be one form of advertising that is used most often in marketing, despite new advances in technology. On any given day, take a look at the mail that comes in and gaze over it. Some mail may be bills. But when you see an advertisement for something, read it over and see how it is written. This is direct mail. There is a rule that most marketers know when dealing with direct mail. This is known as “Rule of 7.” With the Rule of 7, a recipient must see your message at least 7 times before they realize you exist and take any kind of action. When you set up your direct mail campaign, you want to hit your target at least 7 to 8 times so they will begin to notice you. When creating your campaign, write your campaign so it gets read. The first step in the process is to design your campaign there is constant contact with your customers. Your job is to inform them about what you do. You also need to educate them about what you do and how you do it. You will design your campaign so that it appeals to them. The biggest boom to direct mail you want to achieve is by branding. By branding your business, any time a customer plans a party, and wants bouncing toys, they will automatically think of you and your business. You can brand yourself based on your logo, the colors you design for your business, your slogan, or even a picture of yourself or business. Whatever it is you create, has to be consistently shown to your customers. This is how they will remember you.